It had become a must-do while visiting Paris with the beloved one. One could not leave the City of love without hanging a lock on the Pont des Arts, which is the pedestrian bridge leading to the Louvre and offering some of the most beautiful views in Paris; then one threw the key into the Seine as a proof of indestructible love. Guess how many love locks had been hung this way? Betweeen 700,000 and one million, representing a total weight of… 45 tonnes! Unfortunately this was too much for the railing of the Pont des Arts and a piece of it fell into the Seine one year ago. Since then the Mayor of Paris has decided to have the locks removed. This happened last week. No more love locks, which will be replaced by a glass railing next Autumn. Meantime a temporary railing has been painted especially by four famous international street artists: Two of them are French (Brusk, who painted ‘Love is the key’ and Jace); the other two are the Tunisian El Seed and the Portuguese Pantonio. 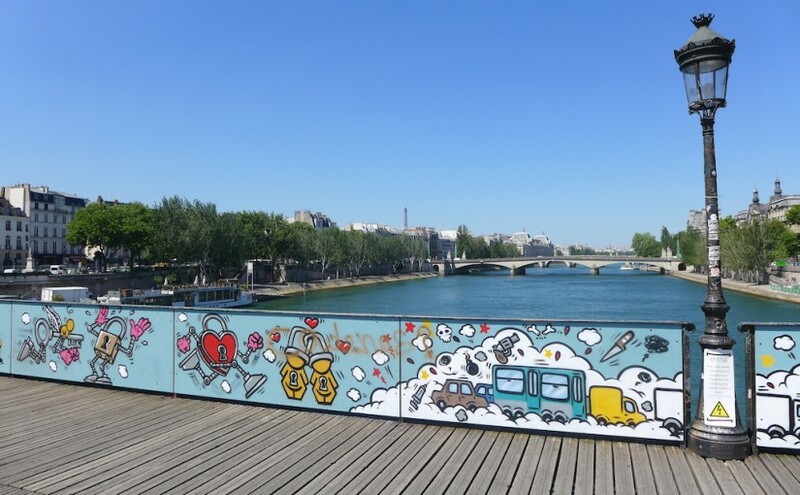 Do not miss this street art exhibition on the Ponts des Arts, from now until October: It’s colourful, a bit quirky but highly photogenic! And don’t be sad. Whereas the locks are going to be destroyed and recycled, the keys remain at the bottom of the Seine forever as witnesses of your indestructible love.